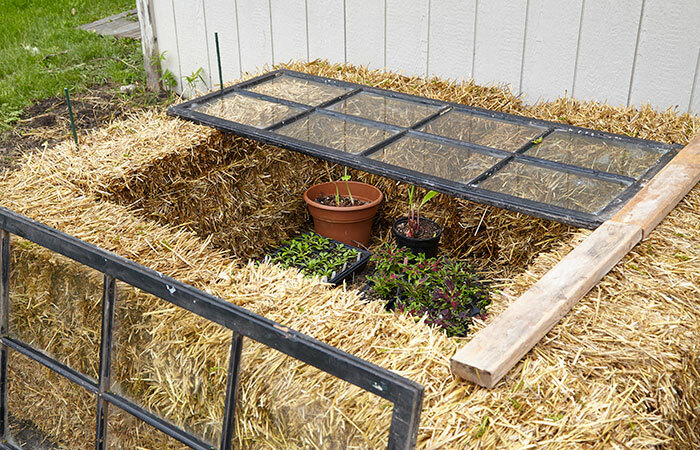 Harden off plants easier with one of these DIY cold frames in your garden. If you don’t have the time or patience to shuttle plants in and out of the house, let them get acclimated to the sun and wind by hardening them off in a cold frame. This handy structure is made to protect plants from harsh weather with no added heat source. Position your cold frame in full sun, near a water source and out of the cold north wind. A spot on the south side of the house or garage provides lots of sunlight and reflected heat. Set a thermometer inside (out of direct sunlight for an accurate reading) so you know what the temperature is. 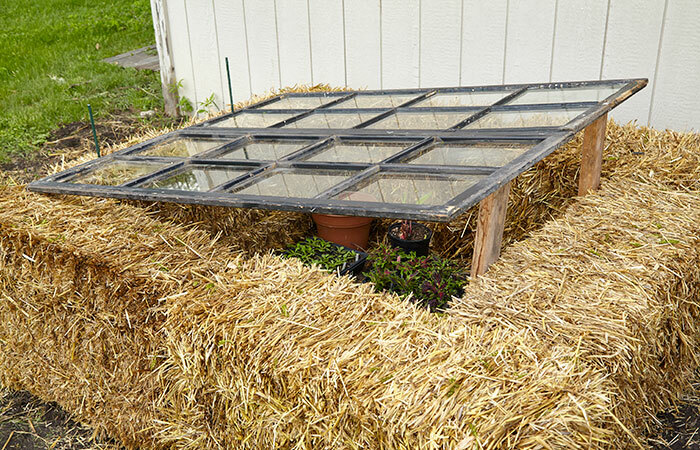 This cold frame was made using two-string straw bales, which are about 36 inches long, 18 inches wide and 14 inches tall. Six bales form a 6-foot square with a 3-foot opening in the center for plants. 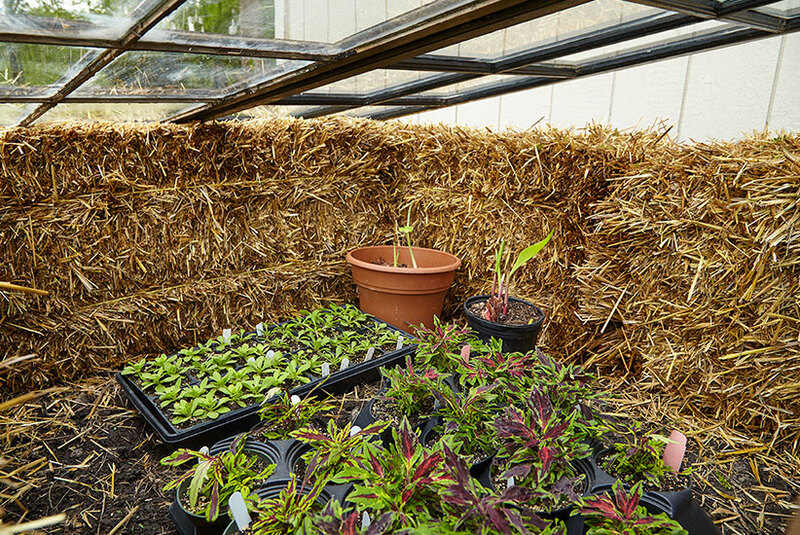 Not only are straw bales good insulators, they also make for easy set-up and tear-down, so it’s possible to use this part of the garden for other things later. Recycle the straw in the compost pile or use it as mulch for vegetable beds. 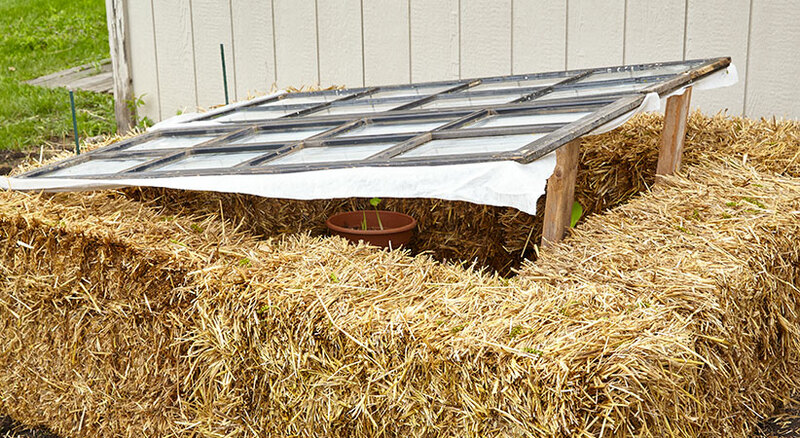 There are lots of other ways to make a cold-frame — check out the DIY Cold frames slideshow at the bottom of the article. Whatever your cold frame is made of, it needs a cover to hold in the warmth accumulated from sunlight during the day so night temperatures (or frost) won’t damage plants. Two old windows in the photo above make the interior space 5 to 10 degrees warmer than it is outside. To get the best growth from your plants, keep daytime temperature inside the cold frame between 50 and 70 degrees F for cool-weather types and between 60 and 80 degrees F for warm-season ones. Ideally, the nighttime temperatures should drop about 10 degrees lower inside. Keep an eye on the interior temperature and raise and lower the windows to keep temps in the optimum range. The photo above shows how raising it even a few inches can prevent excessive heat buildup and help air circulate to avoid fungal disease. Raise the window on the side opposite the direction the wind is blowing to avoid desiccated, or dried out, foliage and prevent the window from being blown off the bales. Close the windows before the sun sets to maintain the heat that’s accumulated. Remove one window completely, like the photo above, then get rid of both as outdoor temperatures are staying in the optimum range. Spring weather is rarely a smooth transition, so if cold or snow crop up, replace both windows until the cold snap passes. For dramatic short-term temperature drops, wrap the whole thing with an old blanket to conserve heat. On the other hand, if interior temperatures are still staying a little too toasty, the photo below shows how you can diffuse the sunlight with row cover. Once night temperatures are warm enough for the plants you’re growing, leave the windows off both day and night. Do this for a couple of days, then put plants in the ground or containers. Now they’re hardened off and ready to bring color and beauty to your garden for the rest of the season! Line up inexpensive cinder blocks and top them off with an old door. Make sure the door has plenty of glass windows to let sunlight in. Form a tent shaped cold frame by connecting two windows with a couple of small hinges to keep them from falling apart. A third window at one end blocks harsh wind. Here’s a permanent cold frame made of lumber with a plastic lid that you can use year after year. 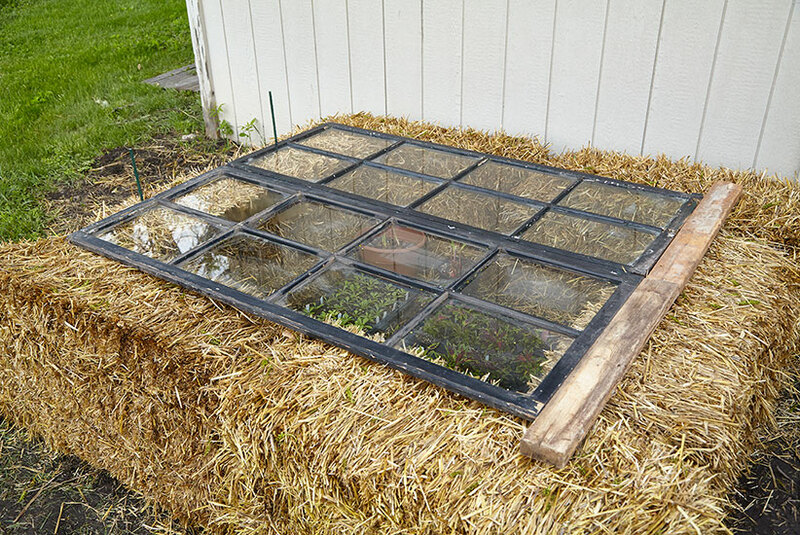 Download the free plan for this cold frame for more details. Set four to six bales of straw (good insulators against cold) on the ground around tender plants. 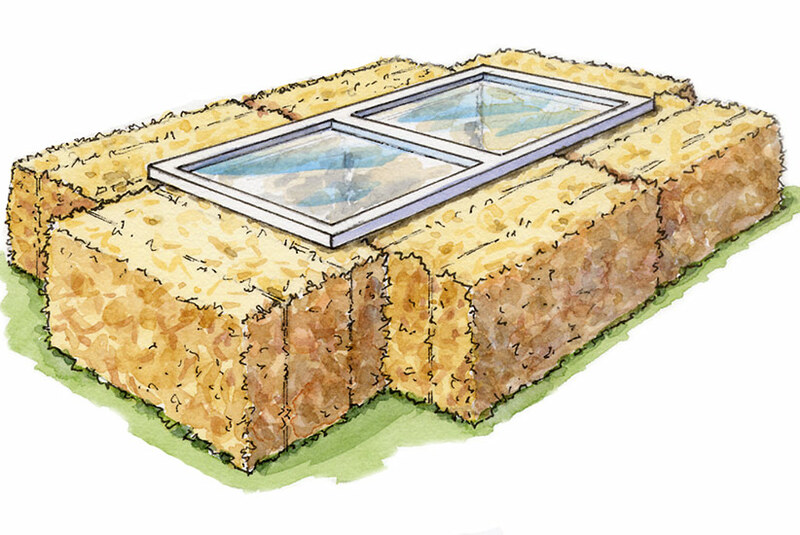 A window or two placed on top lets in sunshine and can be easily moved so plants don’t overheat on sunny days. Later on, use the straw as mulch in the garden.